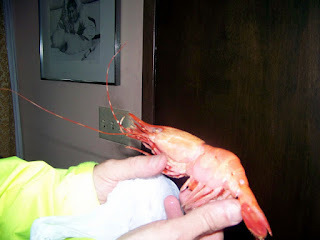 Imagine my surprise when this gigantic Alaskan shrimp came over for a visit! Caught on the back side of Douglas Island by someone from the Alaska Dept. of Fish and Game, such shrimp are often caught but not always of such impressive proportions! My brother thought we would get a kick out of seeing 'her'...and a female she most certainly was. Apparently, the shrimp eggs are quite the delicacy, but not even being a shrimp or prawn eater, myself, looking at this specimen was more like viewing an alien species. He also told me that few people know this, but shrimp are the one species of sea life that are all born female. At around the age of two years old, for whatever reason of genetic selection, some begin to transform and develop into males. This little gal went back home with my brother to join her sister and apparently became dinner. I can't honestly say that I was sad to see her go....though I did feel a bit sorry for her unhappy ending. Hi Michele, all I can say is Shrimp don't like me and I don't like them...nef sed! I'm very happy that Mama lived to procreate!